Decided to repost this from last year as it ties in a little with the Mingus approach I've been talking about the last few days, slowing the practice down at different postures. Here the mudras but it could be at any point, a seemingly simple posture perhaps as well as a more obviously challenging one. I mentioned in a previous post that I'm using Vinyasa Krama to adapt and moderate my Ashtanga practice. One of the ways I'm doing that is through the use of Mudras. Another word for mudra is lock or seal and the ones here, as they come up in Ramaswami's Complete book of Vinyasa Yoga tend to involve engaging of the bandhas. 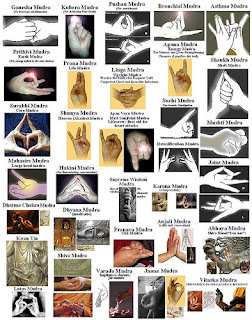 Ashtangi's are already familiar with mudras. The bandhas (or locks) are mudras, Mulabandha Mudra, Uddiyanabandha Mudra and Jalahandra bandha Mudra, but we're also familiar with the full body mudra, Yoga Mudra in the Finishing sequence is, as it's name suggests, a mudra and not strictly an asana. Swami Satyananda Saraswati's in his book Asana Pranayama Mudra Bandha, has this to say in his section on Mudras. I use them for two reasons, one, they tended to be my favourite postures in Vinyasa Krama, and two, I just find them useful for moderating my practice, slowing it down, taking control. In Vinyasa Krama you tend to stay in the mudra for an extended period. You might stay in Maha Mudra, for five or more minutes. I tended to stay for ten to twenty-five breaths each side. Because it's a mudra rather than an asana, you can pretty much practice it anywhere. Below is a video from last year some time. Of course you might feel that it slows your practice down TOO much. 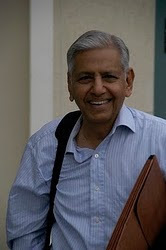 Ramaswami recognizes this and suggests that you might like to spend less time in maha mudra in the main sequence (it comes up in the Asytmmetric sequence in VK) and perhaps longer before or after Pranayama. If you have a separate Pranayama and/or Meditation practice, this is a nice mudra to do in preparation for full or half lotus. In Ashtanga, I include Maha Mudra before Janu Sirsana A. I engage all the bandhas strongly and stay for ten breaths each side. It refocuses my attention on the breath and bandhas and I finding somehow grounding. I have that tendency in Ashtanga to get carried away with the practice, with the athleticism, the strength and movement, the flow of it all, the mudras kind of pull me up a little. The best thing about Maha Mudra is that it pretty much is Janu A without the forward bend, it slips neatly into the practice. I also like to include it before Leg behind head postures as it opens the hip nicely. Another favourite is Mahabandhasana (the great lock). I slip this into Intermediate after Bakasana and before Bharadavajrasana (which is pretty much a twisted version of the mudra). If you don't like Maha Mudra so much you could use this after Tirang Mukkha Eka pada Paschimottanasana. From that posture I tend to cross my extended leg into half lotus to jump back anyway, which pretty much puts me into the mudra. Similarly, following Krounchasana in 2nd series or perhaps after Supta Urdhva Pada Vajrasana, it'll settle you before the seven deadlies. I mentioned Yoga Mudra in the finishing sequence, variations of that mudra include bending to the right and left side. Below is Laghu Yoga Mudra (Simple yoga seal) again the bandhas are engaged. And just one more because I like it a lot and and always try to include now at the end of my headstand, Viparita Yoga Mudra (inverted yoga seal).